This jumbo box of flowers is an amazing gift. The perfume of 100 stems of beautiful narcissi will bowl over the recipient. The perfect gift for a friend with a large house or plenty of vases! The flowers will arrive by 1st class Royal Mail in 10 bunches of 10 flowers, packaged simply in a sturdy box, wrapped in decorative craft paper and green tissue. Foliage, flower food, an informative flower care leaflet and of course your personal message on an attractive gift card are all included. To ensure the best possible vase life, some flowers may arrive less open than shown in the picture. As with all our flower packs, the price shown includes delivery to any UK address by Royal Mail 1st class postal service but not any vase or container shown in the photos. From October to Easter different varieties of scented narcissi flower at different times so the flowers sent may differ slightly from those shown. Although we try to include a mixture, it might not always be possible to include both white and yellow varieties. Please call if you have a specific request or need more information. All our flowers are sent by 1st class Royal Mail and the price includes delivery to any UK postcode. We can’t guarantee an exact delivery day or time, but the majority of orders will arrive the day before your chosen delivery date. 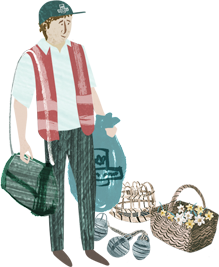 For example, if you selected a Saturday delivery your flowers will leave the Isles of Scilly on Thursday and should arrive either Friday or Saturday. However due to our remote location occasionally the post is delayed, usually due to weather. If you selected a Tuesday delivery your flowers will leave the Isles of Scilly on Monday and should arrive either Tuesday or WEDNESDAY. If you ever have a problem with our service let us know as soon as possible so we can put things right. ...weekends and bank holidays because we want your flowers to be as fresh as possible. This is why some days are blanked out on the calendar. All our boxes are clearly labelled, ‘Fresh flowers please leave’. The postman makes the final decision to leave them or not. In the vast majority of cases flowers are left in a safe place. Don't forget all our flowers are guaranteed. Royal Mail are very busy in December and delivery can take longer so the December delivery dates are only approximate. on the beautiful Isles of Scilly. We’d love to hear what you think about our flowers. It’s often your feedback that helps us improve what we do. Please remember that all our flowers are guaranteed. If something has gone wrong contact us directly, info@scillyflowers.co.uk or 01720 422169, so we can try to put things right. I've been sending (and receiving!) flowers from Scilly Flowers for many years now. Always beautiful, arriving promptly and great that the packaging is now plastic free! I couldn’t believe just how many flowers were lying neatly packed in the box, it was a great surprise. Every flower was in perfect condition and I had enough to fill 2 large vases, I’m now looking forward to enjoying them for several days. What a delightful surprise stunning and fragrant and would use the service in the future. Thanks for the surprise. Sign up today and make sure you never miss a special offer. Sorry, but we are no longer able to deliver these flowers on the date you have selected. Click the OK button below and we'll refresh the page so you can see the latest delivery availability. Sorry, but we are no longer able to deliver these flowers on the date you have selected, as the last dispatch time for today has passed (normally 12:30pm). Click the OK button below and we'll refresh the page so you can see the latest delivery availability. Sorry, but these flowers are now unavailable. Click the OK button below and we'll show you our current range.